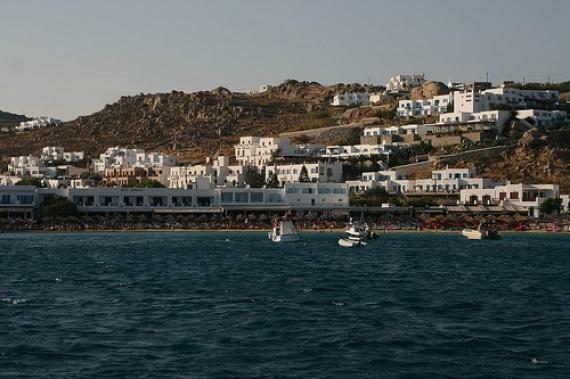 Super Paradise beach in Mykonos is the most famous beach of the island. The crazy all day parties on the beach made ​​it the most important attraction for young visitors and VIPs. Many people and amazing clubbing at its best! And if you see a celebrity next to you, don't be surprised... The beach of Super Paradise, located 6 km southwest of the town of Mykonos, in a blue bay with wonderful view and crystal clear sea. Here you can drink cool cocktails and eat fresh fruit salad from the beach bar, and there is an excellent beach service. Sunbeds and umbrellas are for rent and for those seeking direct contact with its golden sand, there is room for being able to stretch out their towel. Also available to the public is always a lifeguard. In Super Paradise there are comfortable and fully renovated rooms. It would be useful, if you choose Super Paradise as your accommodation, to make your reservation in time, especially during peak months (July-August). The parties in Super Paradise beach last from morning till next morning. Characteristic of the parties at super paradise is that the organizers are... unnecessary, since everything is done from one moment to another, as long as someone simply mentions the word P-A-R-T-Y!. Besides being spontaneous, as many believe is also the best! Super Paradise beach became popular in the 1960's when the young hippy came here for nudism. Now, the beach is popular among the young visitors, the gay crowd and the celebrities. During the day, the beach is the hottest spot for visitors and sunbathers, but in the late afternoon the party begins. On the right side of the beach, the gay crowd and the nudists, party in their own way around the pool club. But Super Paradise Beach is for everyone! Families enjoy its stunning beauty and sometimes parents come back to... join the party. DO: Party, party, party! What else? DON'T: There is no bus for Super Paradise beach. You can come here only by car or motorcycle. Find information about selected Hotels, apartments and rooms in Super Paradise Beach to choose the perfect place for your accommodation.